I can say that in more ways than one – I truly am my father’s daughter. My love for food, eating and talking about both (or in general) – most definitely all come from my dad! Though I may not always like to admit it, I can be his clone in many ways! As a Greek girl, (also from my dad) who has been gluten-free for nearly 10 years, one of the saddest things I have had to endure is saying good-bye to sooo many of my favorite classic Greek dishes – spanokopita, taramasalata, baklava, pita, gyro wraps, moussaka, pastitsio, melomakarono, loukamathes – oh my gosh I could go on and on and on (and now I am super hungry). Thankfully, a couple of these dishes can be made gluten-free, so I haven’t had to let go completely. This dip isn’t something I grew up, like many of those aforementioned dishes, but rather it was a dish my dad had somewhere along the line at a restaurant and became obsessed with recreating. 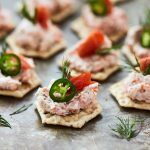 Since he perfected his recipe a few years ago, he has pretty much brought this dip to nearly every get-together and everyone that has ever tasted it – soon becomes obsessed, too! I myself am one of those people and I’ve taken to altering his recipe slightly and making it for my own dinner parties and other get-togethers. Since we moved out west from New York to California in 2013, this dip has been a nice way to savor some of those flavors of home. 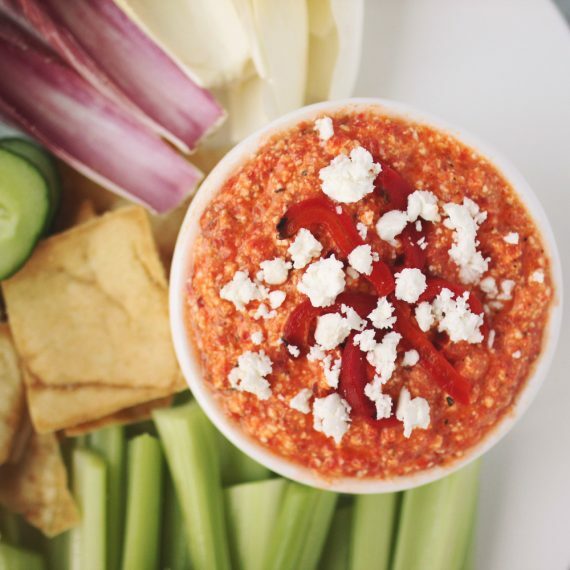 Htipiti is a classic Greek Roasted Red Pepper and Feta dip / spread, that can also be called Kopanisti or Tirokafteri, depending on the ingredients. I have seen many variations including peperoncini, red cherry peppers or other hot peppers instead of the red bell peppers, sun dried tomatoes, green onions, kalamata olives and some even include yogurt. 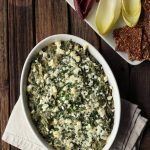 Many recipes call for whipping the dip until it is totally smooth and creamy, but there is something I prefer about this having a rustic texture, with little bits of feta, pepper and garlic in every bite. Plus, this is how my dad serves it (again see above). 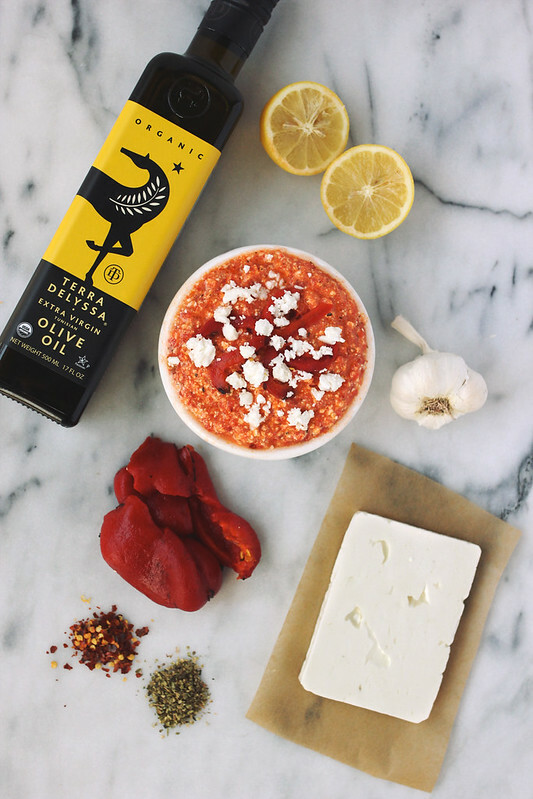 What always stays the same no matter what you call it and how you serve it – is the amazing combo of the smokey roasted red peppers paired with the tangy, salty feta cheese with a hint of spicy heat. I love serving this as an appetizer with some homemade stuffed grape leaves and maybe even a lemonade spiked with ouzo to wash it down. Opa! 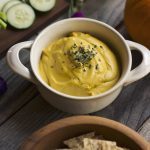 I made a double-batch of this dip today to bring to a fun get-together tomorrow in LA with some amazing blogger ladies – hopefully they like it as much as we do! Add the garlic to the food processor and pulse a few times to chop. Add the roasted red peppers, feta cheese, olive oil, lemon juice, oregano, red pepper flakes and cayenne. Pulse a handful of times to get desired texture or process until smooth and creamy. Whichever you prefer. Give the dip a taste and adjust any seasonings as need. Add salt to taste, if necessary. Garnish with red pepper flakes, little strips of roasted red pepper, some crumbled feta and a little olive oil drizzled overtop, if you'd wish. Serve with pita chips, crusty bread, lentil chips, celery sticks, celery, endive, radishes or whatever your little heart desires. I am a FIEND for dip. This looks awesome. 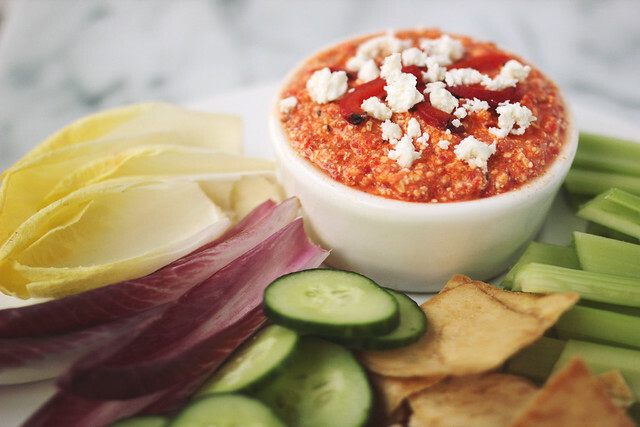 Red pepper dip for the win. Can never go wrong with a good dip 😉 Thanks Sarah! This looks amazing! And Easy! Thanks so much Meg, it really is so easy! Mmmm love dips during the summer! 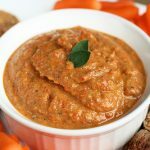 This looks so fantastic as I’m such a fan of roasted red pepper! Thanks, I am the same as you, so great for picnics, beach trips, BBQs – and more! 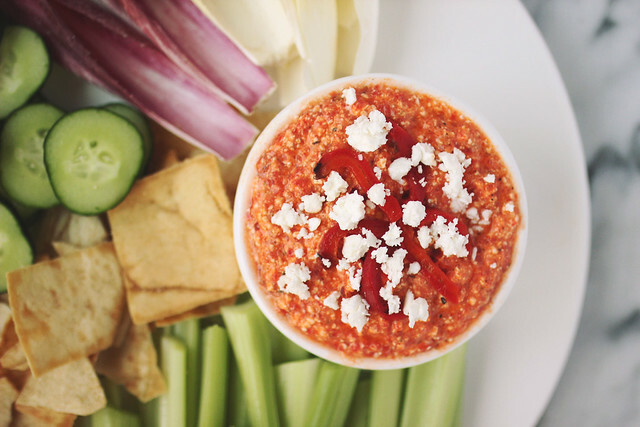 I love the spicy kick this dip has — it rocks! Well done, well done! This dip is SOOOOO good! This dip looks great for a party! 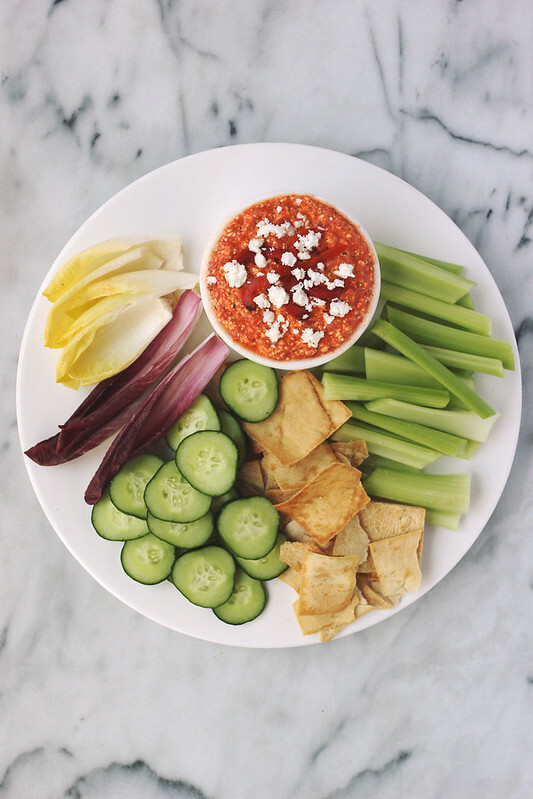 It’s fun to see how many whole food options there are for dips and party food. So many times people equate parties with junk food – I love finding dishes like this that prove them wrong. Thanks for sharing your family recipe. This sounds amazing! I will definitely have to try it. This is delicious and has just become my go-to party dish! Thank you! Hi Beth, I started reading your blog and you mention you’re gluten intolerant and had to give up taramasalata!! Well, surprise! Instaed of making the taramasalata with bread just add almond meal! It’s even better!! Try It and let me know. Hey Stephanie! Oh wow!! You are the best, this sounds incredible. I cannot wait to try it out this way. Thanks so much. Well, YUM. I’m salivating just from reading this, kudos & thanks! Can this be made ahead of time? I would love to make this a day before my party. Definitely, you can make this a day ahead. In fact the flavors will be that much more pronounced, it a good way! Hope you enjoy.